If you live long enough, your childhood will come back to you — all that was old will become new again. Growing up, I noticed all the nostalgia marketing to Baby Boomers, before I knew exactly what it meant to be a Baby Boomer. Later in life, I joked with my friends about when pastels and espadrilles would make a come-back — the Miami Vice look — because we knew as part of Generation X, it was only a matter of time before the fashions of our era would re-appear like bell bottoms already had. Well, I’ve lived long enough to see these premonitions manifest, the biggest sign being the Netflix series, Stranger Things, which is set in the early 1980s and hits every Gen X nostalgia button possible. Central to the show is the kids gathering in the basement and playing Dungeons & Dragons, the geek-loving, dice-rolling fantasy role-playing game that was so controversial 30-odd years ago…just like I did with my friends way back then, along with reading Marvel comics. Now, all those Marvel comics characters are now headlining multi-billion dollar movies (which my girls and I have watched all of). All the Cool Kids are Playing Dungeons and Dragons?! 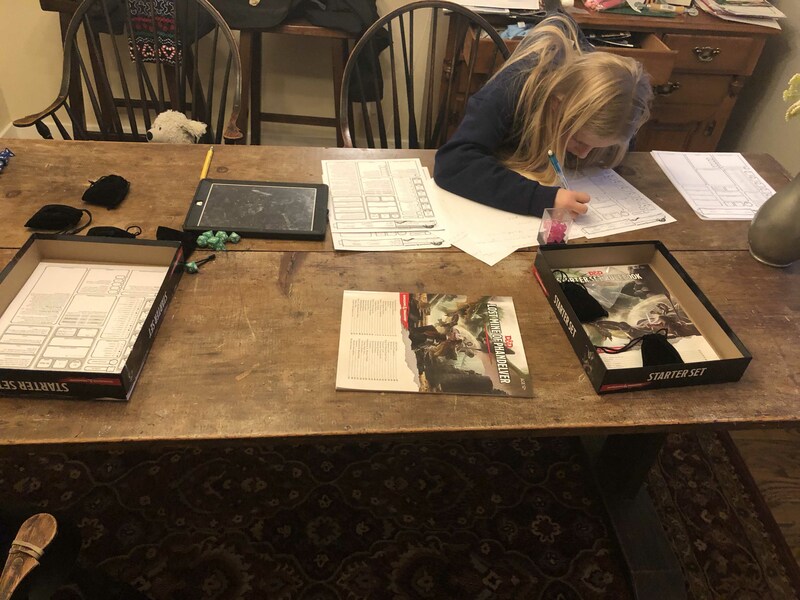 I mentioned D & D to my daughter, who told me that the “nice boys” all sit at a table at school and play. She told me she wanted to learn how to play too. I related my childhood tales of playing D & D, some of the adventures we went on. and all the books I owned that I gave away because I never thought I would use them again. Two days later, thanks to Amazon Prime, I am now in possession of a brand-new Dungeons & Dragons Starter Set. My daughters are geeking out with the excitement of creating their own characters (wood elf sisters) and setting out on their first adventure. D&D (or any role-playing game) is, as the article above I linked to argues, a wonderful alternative to depression-inducing social media because players sit around a table, face-to-face and use their imaginations to work together, solve problems, resolve conflicts, improve their social skills, develop creativity and learn to tell powerful stories. So dust off your Player’s Handbook, gather round with your friends, and roll the dice…adventure awaits! Oh, and teach your kids how to play, you won’t regret it.